View More In Combs & Spines. Make your proposals and reports stand out with a sleek, professionally finished look. Insert document and use zip tool (incl.) to snap the clicks together. 32-ring plastic spine lets pages lie flat with 360° rotation for convenient note taking and photocopying. 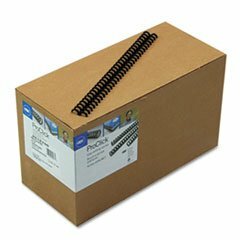 Use with any WireBind® binding system or with pre-punched paper. For 11" size documents. Sheet Capacity: 45; Spine Diameter: 5/16"; Number of Rings: 32. If you have any questions about this product by SwinglineTM GBC®, contact us by completing and submitting the form below. If you are looking for a specif part number, please include it with your message.